When I went to bed last night I was thinking that fishing today would be similar to yesterday, and then late last night we had a hectic storm with very heavy rain, the thunder was so hard the windows in my house were humming and when I saw the lightning I knew today would be different. When I woke up at 03h00 it was still raining lightly and there was no wind, the bay was full of rubbish and the water chocolate brown. With all this I had to really change my tactics planned and once out the harbour saw all the bad weather up North and decided to head South. 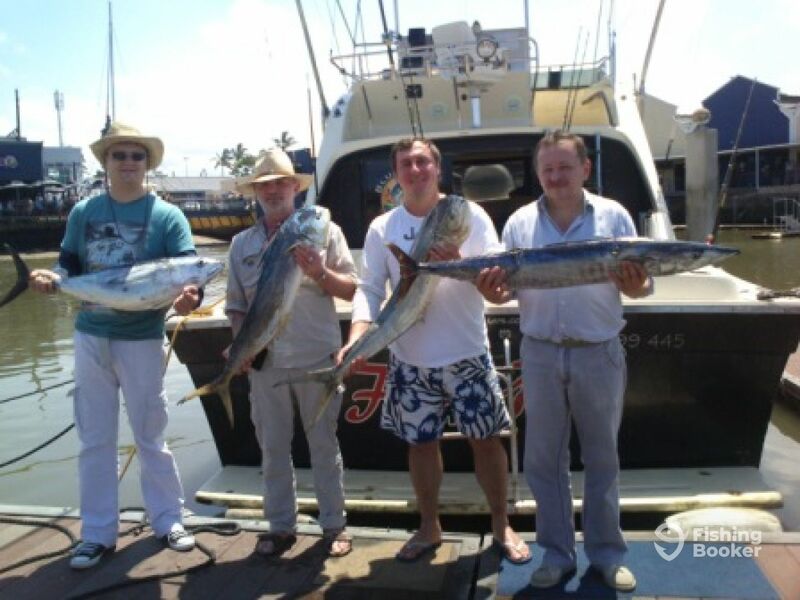 After a while I saw a debris line and a little deeper out I found a current line with cobolt blue 25deg.C water and so we ran some rappies on light tackle very slowly along the line and we landed a Wahoo, 2 Dorado and a Yellowfin Tuna. Then the fun began when one of the reels screamed off like mad and after about an intense 40minute fight we lost a black plastic bucket about 10m from the boat. Things were about to get better for us when we got spooled when one of our lines snagged a drum line with what I assume was a very large shark attached to it. I tried to chase but could not keep up and the drum was making a serious bow wave and a wake we wanted to get the drum line and release the poor shark but were not able to do so. I find it sad that people are still drum lining sharks.